Journals (I call them ‘a writer's notebook’) can be a primary teacher’s best friend or worst enemy. On the one hand, they are easy to plan for: ‘Tell me in your journal what you did on the weekend or chose your own topic to write about in your journal’. They can also provide daily writing opportunities, help establish a writer’s voice; provide practice of writing forms, grammar & so on. The problem with journals is that when we ask students what they did on the weekend or what they want to write about, it often results in the answer "I don't know." Also students tend to write about the same topic every time: ‘On the weekend I went to a friend’s house. I played games. I had dinner’ and so on. Their writing can lack variety and the topics they choose can be too mundane and repetitive to really engage their imagination. Of course, you can use anchor charts to help brainstorm writing ideas and also to reference writing forms. However, keeping the charts up to date or organizing the topics into categories can be a pain to upkeep…and can waste a lot of chart paper! Wallwisher is an online application that acts as a virtual bulletin board. After you create the wall, you, or other people, can pin comments to it. You share the URL with others so they can add their ideas to the board. 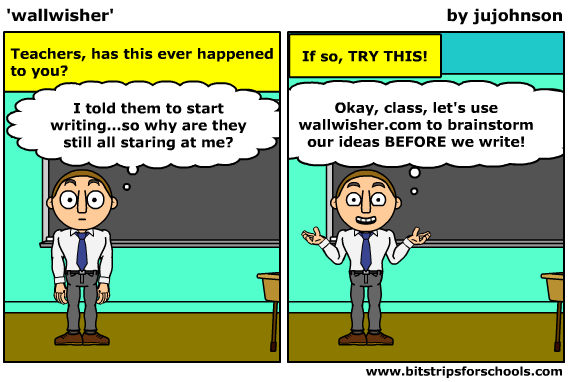 Wallwisher is a great place to collaborate thoughts and ideas about a subject. Combined with an interactive white board or mobile computer lab, Wallwisher becomes a powerful collaborative teaching tool. In my grade 2/3 class, we’ve used Wallwisher with our writer’s notebooks or journals. When my students pull their writer's notebooks out, we begin by brainstorming as a community a few ideas to add to our wall wisher bulletin board. In this way we always have a pool of ideas to write about. Since using Wallwisher I no longer have students blanking staring at their desk during our writers notebook time. If they need an idea, they can come up to the Smartboard and browse for a suggestion. (Usually, I have four or five students who need to do this before they commence their activity.) As the wall gets bigger, we can sort the ideas into categories by simply dragging like ideas together. We can also add URLS and media to the posts. To see some of the writing ideas we came up with this year, click here.